recommendations and a quotation to undertake works. In keeping with our ethos of the conservation and restoration of historic stained glass windows we do not recommend or carry out any unnecessary work. Our staff are experts at their work. All are very experienced, dedicated people who do their utmost to keep any disruption to a minimum while work is in progress. Sheridan Stained Glass and their employees are fully insured and are in full compliance with all Health and Safety regulations. 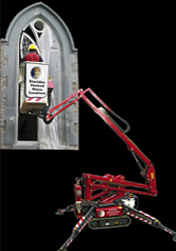 All equipment and tools used are modern, regularly serviced and suitable for which they are put.